What I Talk About When I Talk About Running, a memoir by the author. 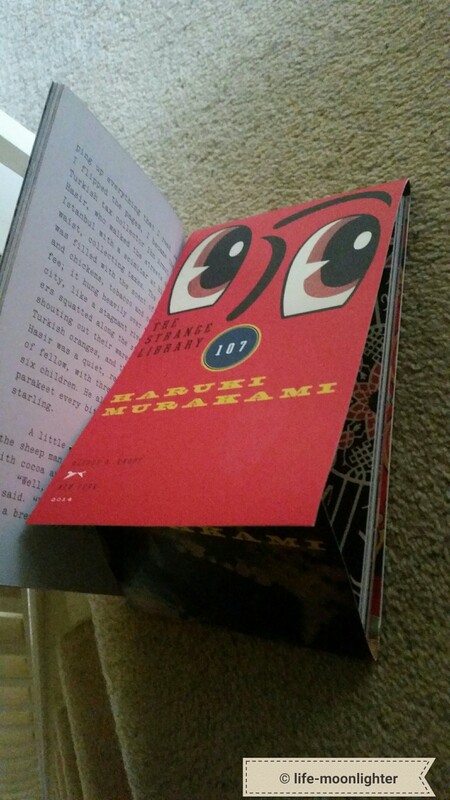 It was in the bookshelf of a friend, and she mentioned that she likes the writing. I was inclined to get the memoir first, but I usually favor fiction over non-fiction and hence I am here with The Strange Library instead. This was a birthday gift for someone who likes Japanese things, and also for the someone who perhaps may not sit down for a too long novel. The second part was true, it is a short book. But nothing in the story to mark it particularly Japanese. Well, there is sea urchin and mackerel and sesame seeds mentioned in a meal, but other than that the story could be set anywhere. (Not that people elsewhere don’t eat these things, but ahem, I was assuming these ingredients altogether form a part of Japan’s cuisine.) But in the way of intriguing stories, The Strange Library is an excellent one. Perhaps I was drawn to the book as it says ‘library’ on the cover, and I will take libraries of any kind anytime. So, the young man (boy?) goes off to a public library to read. And thus ensues an adventure. I read somewhere that this is a book for young people too. As in maybe as a young adult fiction. There are macabre happenings, that I (being slightly of a squeamish variety) quickly read through. I found, for a change, given that I am highly preoccupied by life now, that the story offers a high level of visualisation. In parts because of all the artwork that is present in the book’s pages, that straight away illustrate elements in the narrative. With that clutch, it is neigh impossible to not imagine what is happening ourselves while reading it. Hence I found myself visualising the action as I read the book in two short sittings, a few days apart, interrupted otherwise by the business of living. So even now, the strange library and its inhabitants are visible to me. The many steps the boy takes inside it, descriptions of rooms and people, the light or the lack of it as we go through the doors. Oh yes! The actual physical book! It is full of illustrations as I noted above, these draw your eye to the important pauses in the story. Then the cover. This book has been published with different covers and artwork in various countries. One has a picture of a library card on the cover. The other one, that I got, has an cover that looks like an envelope, and you could use leaves of these as a bookmark. And the typeface used looks just like a typewriter print. I am sure those who are obsessed with the physical form of books would find a lot to delight here. Did I say anything about the story yet? So the boy comes into a library, and many strange things happen. There is some moral tale here, but the book finished so quickly, and the action was so fast-paced that I had no time to ponder. By the end of it all you are so well relieved to have reached the end, that you had no time to stop and contemplate what you went through. I paused only when I read the short postscript of sorts in the last page. Then I realised that there are deeper issues at work behind all the storytelling, and even metaphorical allusions to locking away of knowledge, etc, but that is after you are done with the action packed story.